Hostelworld users rated St Christopher's Paris the most popular Paris hostel at the 2011 Hoscars, and it's not hard to see why. We like that each of their beds has an under-bed locker, privacy curtains, a reading light and two power outlets. This hostel contains a bar and club, with discounts on drinks and what visitors assure us is 'good-value, yummy food'. Our guests have said this hostel has a 'good atmosphere downstairs and always [has] heaps of people around', 'perfect for people that want to have some fun'. Voted Hostelworld’s most popular Hostel in Paris 2014, 2013 and 2012! 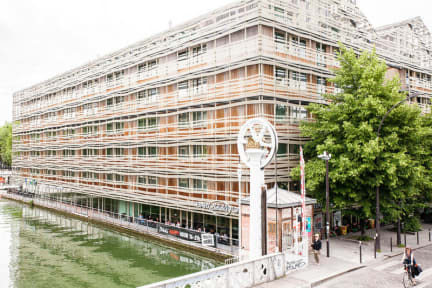 With a waterfront terrace on the canal, with free WiFi in every room, we’re located just 3 stops away from Gare du Nord station a 15 minute walk from the Zenith concert hall. Our hostel bar is open every night with events to meet travellers and you’ll receive 25% off food and get 2 for 1 drink specials all night. Each room includes electronic key security, secure lockers, private or shared bathrooms and modern beds with curtains for extra privacy and comfort. Save time - Check in online! Below the hostel you’ll find the backpacker bar Belushi’s - where all our guests receive 25% off food and 2 for 1 drink specials all day every day! By day, you can chill by the Canal on the waterfront terrace and enjoy the Parisian lifestyle, by night you’ll get an epic range of events in a venue packed with an international and local crowd - so you’ll have no trouble meeting new people. To with this our basement nightclub holds a variety of international and expat events every weekend. Хороший хостел, разочаровало только, что камера хранения вещей платная. На это я не рассчитывала и на рецепшине мне этого не сообщили. Хороший хостел. Все нормально. Бронируйте !